Welcome to Down On The Street, where we admire old vehicles on the streets of the Island That Rust Forgot: Alameda, California. We've seen quite a few late R107s in this series, so now it's time for an early one. This car spent most of the last few years living in the garage, as one of several project cars owned by a retired Mercedes-Benz repair shop owner. 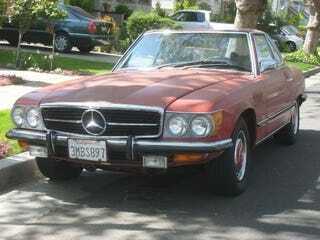 Now it's on the street, to make room for a W111 coupe. It needs new paint, but that's about the only problem with this solid, extremely original-looking sporty Benz. If you look closely, you can see a daily-driven black '70 Dodge Dart in the background.